Are you planning to buy the best wireless dashcam? Do you want to know more about wireless camera benefits and usage? The key benefit of a car wireless camera is that you can connect it, without wires, to your smartphone. So, with such a gadget, you’ll view immediately or store any event that might happen on the road or the parking lot. You can also check what happens overnight with your car – theft attempts, damages, crashes and more. 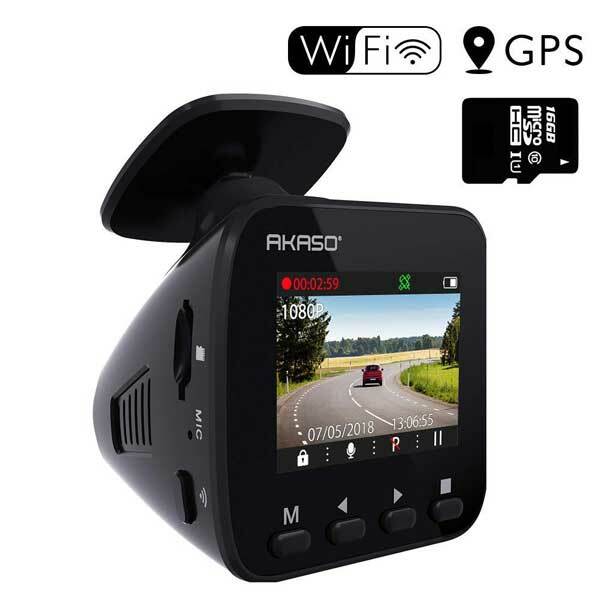 A wireless dash cam is the best choice for you as it lets you control every aspect of the device without any hassle of removing or transferring the video recordings to the SD card. In the event of a car crash, your wireless car camera records everything and prove your stance in front of the law enforcement authorities. If you are interested to know more about the WIFI enabled dash cams, such as benefits and usage, you can go through the following article. This article covers everything and offers a complete buying guide to help you make a smart decision. What Is a Wireless Dash Camera? WIFI enabled dash cams can offer visual and clear evidence of an accident without removing memory cards. A quality dash cam can help you in many ways to prevent an unpredictable situation and to protect your interests in the best possible manner when you need it most. How Does a WIFI Dash Cam Work? A dash cam records the events going around your vehicle. When it has WIFI ability, you can expect some other benefits. Most wireless dash cams come with a proprietary Android or iOS app which you install on your smartphone. Once you connect your smartphone to the wifi camera, you can play video recordings or receive live streaming from the dash cam. Some dash cams send recorded events to a cloud service from where you can access them later. Also, you can share your most exciting videos to Youtube or other social networks via WiFi. It’s important to know that a wireless camera does not have internet out of the box. For this to work, you need to download the proprietary Android or iOS app on your smartphone and also connect the wireless camera to the internet. As soon as you pair the wireless car camera to your smartphone, the wireless connection will allow your smartphone to operate the camera remotely. A wireless dash cam connects to a chosen hotspot. Your smartphone can be an internet hotspot, but you can use other mobile devices for that. For small distances between camera and smartphone, you should use your smartphone for internet sharing. However, if you want to receive live footage from the dash camera no matter where you are, you need a portable hot spot that provides wireless internet in your car. Some wireless dash cams come with cloud services which can be free or paid monthly. The cloud service is accessible from anywhere, and it stores some extra data from the device and also backup’s every critical footage. Also, with a cloud service, you can stream live from your dash cam. Why Buy a WIFI Dash Cam – Advantages Over a Standard Dashcam? WIFI enabled dash cams are receiving increasing popularity due to some benefits. Once you have a wireless dash camera, you do not need to go through many hassles such as reducing the size of the videos and improving discreetness to share footage. Another benefit of the WIFI enabled dash cams over the standard dash cam is that it offers ease of changing settings. The wireless feature lets you do many functions. You can use your phone to change the settings or recording quality. The smartphone will work as the remote control that you can use to control every aspect of the car camera. Wireless-enabled dash cams will allow you to send videos through email, replay footage in high quality and upload the footage to the internet. In the event of a crash, your dash cam provides instant proof to the law enforcement authorities without using a laptop or without removing the micro SD card. The viewing function is very useful as you can see every event, live, on your smartphone’s display. If you have non-WIFI equipped dash cam, then you have to either remove the memory card or remove the dash cam altogether. The WIFI function will prevent this hassle and will offer better convenience to view the footage and share it with luxury. It is essential to go through some key features to ensure that you are buying the best product for your usage. heat tolerance, G-sensor, and GPS features. As you are buying a wireless device, make sure that the wi-fi connection works good, and the smartphone app is safe and bug-free. User reviews are the best informational resources in this case. The quality of the video is the most critical aspect of ensuring better footage. You should buy the one that comes with a good video resolution and an excellent camera. Look for an HD camera or even 4K if you can afford it. Besides resolution, look for a wireless camera that has quality lenses. Without quality video lenses, the camera records low-quality videos which are not useful. If you intend to use the wireless dash camera when the car is off, check if you can connect it to an external power box. The power box provides continuous power to the camera and also protects your car’s battery from being drained.